The newest concept in close up magic! Start off your collection with this beautiful brass tube that has a rubber band at one end. You remove a rod with a ball-shaped end from the tube and reinsert it into the tube until it can be seen sticking out the other end through the rubber band. You say that you can hook the rubber band with the ball and stretch it through the tube. Then you show how to do it, several times, releasing the rod and letting it snap back into the tube. It looks so easy to do, but spectators will not be able to do it! Great street magic that you can perform anytime, anywhere because it's all right there on your Trick - Key, key ring! Our version of the Snapper, works much like the original version, however the tip is shaped in a way that you can't stumble upon accident and the band can be set to catch the back of the rod making it bounce off of the rubber band, or get stuck between the center of it (without enough tension to make it snap back)! The Trick - Key Magic Collection makes a great gift for your favorite magician! 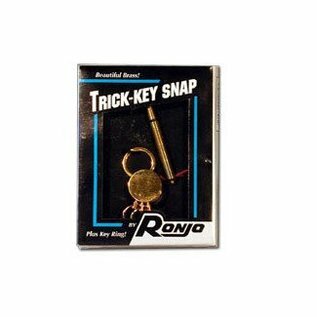 Trick - Key Snap comes with snapper trick, consisting of a specially designed rod and tube, plus brass key ring to carry this, your keys and other Trick - Key Magic items on and detailed instructions.